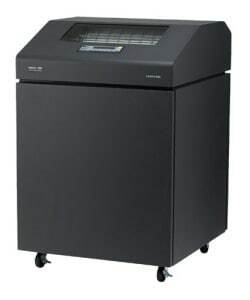 The IBM InfoPrint 6500 V20 printers (cabinet model) are high speed line printers. They attach to a wide spectrum of IBM systems — from IBM mainframes and parallel servers to PCs. The IBM InfoPrint 6500 V20 line printer with ribbon cartridge technology is built to adapt rapidly to changing business environments. These line matrix printers come with “ribbon minding” technology. With “ribbon minding” you’ll always know how much ribbon life is left. With a state-of-the-art print engine and controller technology, you’re able to confidently meet the demands of any back office, data processing or supply chain applications. Powerful remote management capabilities help you get the most from your printer. With the Printer management utility you’re able to automatically e-mail notifications to operators, including real-time printer status. Easily download settings to multiple printers and remotely access the printer’s operator panel. With an IBM InfoPrint 6500 V20 line printer you can take advantage of an optional integrated wireless Ethernet interface. Additionally, increased processing power and enhanced Microsoft® Windows® drivers deliver improved output performance, especially when printing barcodes, graphics or overlays.